Also if his was so 'overclocked' as you say it would seem to have been an insane risk on his part to shoot the centuries old antique! What I was thinking is that if Gallwey really was just really lucky and happened to get his hands on some examples of a really "delicate" style of crossbow which didin't usually survive 400 years and thus doesn't show up in museums very often, that might help explain a lot of the problems Tod is running into. Tod said earlier in this thread that examples of medieval crossbow typically have a cross-section ratio of around 3:1 or 5:1, which is a big part of the reason they seem to have such a sluggish cast. The steel bow of Payne Gallway's siege crossbow however was 2.5 inches wide and 1 inch thick at the center for a ratio of 2.5:1 (and we have no idea what the dimensions were near the tips). The steel military crossbow he says could shoot a bolt 390 yards was, in the center 1.75 inches wide and 0.75 inches thick for a ratio of 2.33:1 (and again, we don't know what the dimensions were near the tips). I don't know if tod has tried making steel crossbows that thick before? Even for a company of mercenary foot crossbowmen that are all equally trained, it would have still been best to have a diverse mix of different sized windlass crossbows, one foot crossbows, two foot crossbows, etc. The heavier crossbows could be used to conduct long-range harrassment or to aim at specific, high value targets while the lighter, quicker-firing crossbows keep shooting to cover the heavy crossbows as they reload and to pick off all those annoying longbowmen that keep trying to approach. All interesting theories but I don't think you have to guess so much. Look into it you'll start to find the real patterns of what they actually did and didn't do. As far as I'd read, at least for Central and North Eastern Europe - using the windlass spanned crossbows in the field had become fairly rare by the 15th Century. The two types used in the field by towns, royal armies, Hussite Armies, and groups like the Teutonic Order, were basically the 'medium' powered the stirrup crossbow, and the more powerful cranequin crossbows. The former were cheaper and could be made more quickly, the latter were more expensive and also required the cranequin device, but were of course more effective. Regarding the ranges you give for medium-power crossbows and arbalests, can you give examples of some of the sources that's based on? It would really help a lot. I think I've posted a link to this article before in this thread. It's a useful summary for late medieval crossbows derived from the records of the Teutonic Order. Among other useful things he enumerates the numbers of types of each types of crossbow they had on hand and were producing (and for example how many of each type of prod they ordered and how many bolts (a lot!) and so forth. I think his source for those ranges which I quoted was from this article, E. Harmuth, Die Armbrust. Ein Handbuch (Graz, 1986), pp. 199-200. And there are a ton of partial translations of other later chronicles in various academic articles. Some of these are summarized in the two English language histories of the Teutonic Knights, William Urban's Teutonic Knights: A Military History and Eric Christiansens The Northern Crusades. I found the Balthazar Behem Codex Picturatus (late 15th / early 16th Century) useful as it includes guild regulations related to the militia including the crossbows. It includes images of practicing shooting the popinjay with crossbows too. Another good primary source are the chronicle of Henry Bolingbroke, Earl of Derby, later King Henry IV of England, who made two Crusades to the Baltic in the years 1390-1391 and 1392. He participated in the siege of Vilnius and was engaged with the Lithuanians (and their various Latin / Christian allies) on behalf of the Teutonic Knights, he also brought a few hundred English longbowmen with him so you do see direct conflict between the two weapon systems. His journal is available online. Unfortunately it's in Latin and so far as I know hasn't yet been translated into English (if anyone knows otherwise let me know). I have had friends translate a few small sections for my own research but they are rough translations. The famous Schloss Wolfegg housebook and the Mester van het Hausbuch both feature crossbow hunting and details on warfare with mounted and infantry crossbowmen. Several Late medieval war manuals also get into this stuff including Conrad Keysers Bellifortis, Johannes Bengedans Kreigkunst und Kanonen, Philipp Monch's Kriegsbuch, and the Ludwig von Eyb Kriegsbuch, as well as the three by Johannes Hartlieb. I also have the Lübeck, Hamburg and Bremen chronicles (which are available in a summarized translation in English and are also available online as direct transcriptions from the 19th Century, in Low German) and I have a copy of the Nuremberg Chronicle with an excellent accompanying handbook. I have some translations from it available. The various Bohemian chronicles and accounts of the Hussite wars, which are too numerous to list here. And then the are the Magisterial academic histories by Jan Dlugosz (which to me is the best history book I own by a wide margin) and he occasionally gets into the nitty gritty details of battles, Piccolomini - in particular his history of Bohemia, and Machiavelli all talk about them. For modern histories I also particularly like Johannes Janssens Geschichte des deutschen Volkes seit dem Ausgang des Mittelalters (which is available in English), as he gets into a lot of detail on the urban life including the shooting contests and quotes a lot of translated passages and Philippe Dollinger's Die Hanse (which you can find in French and English) which also has a bunch of transcribed or translated records and is a great source for any kind of naval warfare in the Baltic. And Hans Delbruck of course. Much more recently Anne Tlusty's Martial Ethic in Early Modern Germany gets into a good amount of detail into shooting contests. She also has several books of translations of records from Augsburg and Nordlingen and a couple of smaller towns. Thanks Jean! I'm slowly trying to work my way through it but this is great stuff! There is this Austrian "poet" named Peter Suchenwirt who described a whole Teutonic Orders reysa or raid from beginning to end, including both some astonishing cruelty and some quite serious peril, where you can see how they could easily get in trouble (extended periods where they were stuck in mud up to their horses saddles etc.). You can find this online but I can't remember where I got it. They have done some archeological surveys where they have actually tracked the course of battles specifically by finding crossbow bolt-heads with metal detectors in the ground and still sometimes stuck in trees. I don't know what kriedegrund or Rotfassung are, can somebody explain? Apparently this is derived from an analysis of an antique in the Beyerisches Nationalmuseum Munchen. And another thing called "Hauteim"? Then a layer of beaten rawhide. So with all that, I think it makes some sense how these things could stop high velocity crossbow bolts and even bullets at longer ranges. Fascinating stuff. The following summer, the Semgallians agreed to attack Terwetein. The said castle was located in their land. It happened on a day which had been previously agreed upon. In the settlement before the castle walls nothing which could be called Christian survived, being captured or slain. A dishonorable man called Bertold was there, the Semgallians liked him because he was a bowman, he became useful to them. If he would come over to them, they would spare his life. He did this and was glad. In a short while the Semgallians found plenty of crossbows and arrows in the dwellings outside the castle. Very swiftly they gathered them together. They were glad about the crossbows. The renegade Christian then took as many archers as there were crossbows. All those who did not know how to use them he began to teach to bend and to shoot. Because of this they let him live. Meanwhile the good Brothers had defended the inner castle in various ways. They intended to guard it and keep it in their hands. At that time an army attacked from all sides. Kreide is chalk (including the kind which tailors use, so you would need to talk to them to make sure they mean calcium carbonate). I am not sure what Fassung means in a craft context. Hautleim is skin glue. There is good information about slightly earlier European shields in Jan Kohnmorgen's book. I am glad you still have time for your 15th/16th century research! Thank you and once again, thank you. I think in other words we just haven't had enough iterations or a large enough community with a need for military grade type late medieval crossbow replicas to move this along faster. Thanks for all the info and the very considered reply, I simply don't have the time right now to respond in any depth, but you are certainly right that we need more people working at it. When you say "reasonably" is that assuming that the guy pulling the belt hook crossbow has as much extra leg muscle as the guy pulling a 140lb longbow has extra arm muscle? Regarding the longbow, while not from me there's a post by a user named Hergrim on r/AskHistorians which talks about some of the shifting opinions about the mary rose estimates quoted in "the Great Warbow"
imo an average draw weight closer to 100-120 lbs better fits the longbow ranges usually quoted by Elizabethan military authors, many of whom were living at the time the Mary Rose sank: an expected average of ~180-200 yards with livery bows and arrows, up to 240-280 yards if shooting light shafts, and up to 320-360 yards if shooting gaming bows and straight-feathered flight arrows. It also helps explain why most of the writers during this period who complain about the "decay" of English archery keep referring back to the days of Edward III and Henry V, long before they were born, and rarely seem to ever bring up "hey, remember some 20-30 years ago when there used to be a whole bunch of big, burly english archers walking around with arms the size of tree trunks? Whatever happened to them?" Calculated a range for which weapon? One of Bichlers hornbow replicas from the last two videos? Understood Tod, I know you have a full plate. Speaking of Bichlers crossbows, I was thinking of you when I saw this beautiful self spanning crossbow. Not a beast like the last two but certainly a nice cavalry weapon! I remember you had done some exquisite ballestrini / crossbow "pistols" and some other similar weapons, couldn't recall if you had ever done one of these, anyway I thought you would find it interesting. 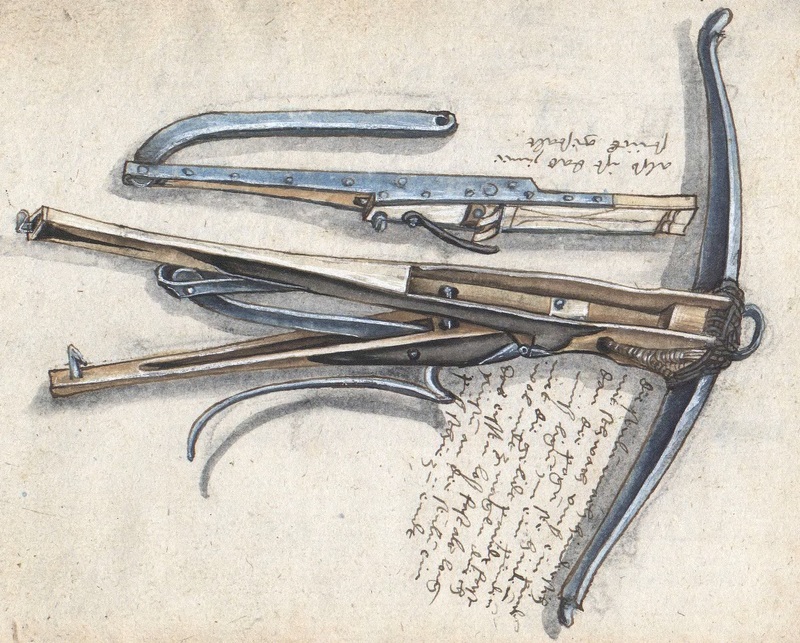 Have there been any serious tests with early 15th-century-style belt-spanned crossbows? Do we know that the crossbows Pero Niño and company were using had power strokes of only 5.5 inches? What's the evidence that 300lbs is the limit? There's a video of you spanning a 350lb crossbow from the belt. In El Victorial, spanning heavy crossbows from the belt is one of Pero Niño's feats of strength. I bet skilled crossbowers in this style were just as developed as skilled archers. I doubt we'll really get a sense the performance of such weapons until we get a bunch of folks who take crossbows as seriously as many folks now take yew warbows. The idea that crossbows don't rely on strength only applies, if at all, to certain crossbow designs. Many of the military crossbows, even into the 15th century, required strength to operate effectively, just like a hand-drawn bow. I came singing in the sun, sword unsheathing. Now for wrath, now for ruin and a red nightfall!